Energy monitoring involves the development of an energy performance model (EPM) that quantifies a relationship between consumption and the applicable independent variables, and the comparison of performance predicted by the model to actual performance by means of CUSUM analysis. Although the EPM can be developed in a number of ways, it most commonly involves the use of regression analysis. • Operating Hours/Occupancy—In office buildings, schools, hospitals, retail stores, warehouses, accommodation facilities, energy consumption depends primarily on the weather through the heating and cooling systems, and secondarily on patterns of use such as operating hours and occupancy. Electricity and fuel each have their own dependencies or combination of dependencies specific to each facility's systems. • Production Level—Energy use in manufacturing and industrial facilities depends strongly on production level or a measure of the facility's output, in units, tons, or some other appropriate unit. Also, energy use in these operations often exhibits a strong dependence upon weather. • Degree Days—Degree days are a measure of the outside temperature for a given period and can often be used to predict the amount of heating and cooling energy a building requires. 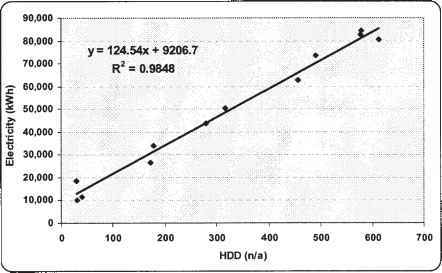 Heating degree days (HDD), for the winter season indicate the difference between the outside temperature and a baseline (typically 65°F or 18°C) and how long that difference exists for. Likewise cooling degree days (CDD) indicate the difference above a base temperature (typically 72°C or 22°C) for the cooling season. Degree days can be derived from temperature measurements at the facility, or can be obtained from weather services and some utilities. For a basic MT&R system, degree days from a nearby site are often adequate although they may only be available on a monthly basis. Ti-To is the difference between the inside and outside temperatures. U, A, CP, N, and V are all characteristic constants of the building, and usually Ti is controlled at a constant set value. Therefore, the only variable in the equation is To and it may be higher or lower than the inside temperature depending on the season. When To is less than Ti, H is a positive number indicating that heat must be added to the building in the heating season, and when To is greater than H is a negative number indicating that heat must be removed from the building in the cooling season. which is the equation of a straight line, as in Figure 1-16, when H is plotted against degree-days, having a slope = (UA + CpNV) and an intercept on the y-axis = c. This constant c is the 'no load' energy provided whatever the weather conditions by such things as office equipment, the losses from the boiler, lighting, and people. Figure 1-16. 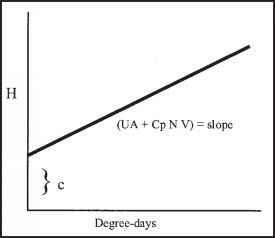 Relationship between degree-days and heat load. where c, the intercept (and, no load or zero production energy consumption), and m, the slope are empirical coefficients, characteristic of the system being analyzed. Energy use data alone are of very limited usefulness in understanding the nature of the energy system, identifying opportunities for efficiency improvement, and controlling energy use in the future. Refining data to information that facilitates these functions involves analysis, following steps illustrated here. • previous year's data—simply using last year as a predictor of this year's consumption. Typically only useful when there are no significant factors of influence. • regression analysis—a statistical approach based upon historical consumption and the factors of influence. 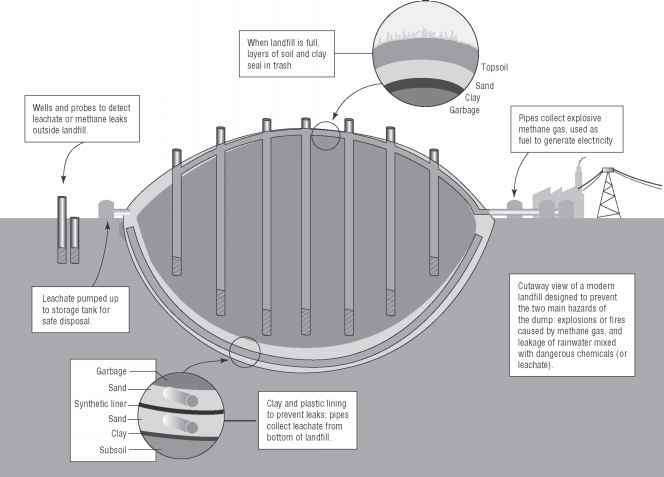 • simulation model—using complex numerical computer models to simulate the energy consumption. The most common method for a basic system is regression analysis. In many instances linear regression of energy consumption against a single independent variable (degree-days or production) generates a valid energy performance model. In some cases, multivariant linear regression, for example against degree-days and production in a plant for which there is significant dependence on weather, is a better representation of the energy relationship. To illustrate, two data sets are shown below, one for a building with energy consumption driven by degree days, and one for a plant in which the driver is production. In each case, the scatter plot produced when consumption is plotted against the independent variable is subjected to linear regression, with the results shown in Figure 1-17. • the intercept, 9206.7, represents the non-heating or weather-independent load. Assessment of building performance may involve an examination of each of these components of load separately. Similarly, a plant production data-set in Table 1-7 generates a regression model as in Figure 1-18.